Stringer said the investigation would cover the New York City Housing Authority (NYCHA), the mayor’s office, the Health Department, and the Department of Housing Preservation and Development, according to the New York Post. It will look at the city’s procedures for addressing lead poisoning hazards, he said. The report comes after the de Blasio administration admitted that up to 820 children in NYCHA housing tested positive for elevated levels of lead between 2012 and 2016, and that the city did little about it. As recently as last week, the de Blasio administration estimated that 19 or 20 children in public housing had concerning blood-lead levels. But now it admits that those numbers were off—by about 800. The discrepancy, however, could be due to a difference in standards. In 2012, the Centers for Disease Control and Prevention (CDC) updated its standards for what it considered a “level of concern” from 10 micrograms per deciliter of lead in the blood, to five micrograms. But NYCHA continued to follow the old standards, reports the Post. In April, NYCHA head Shola Olatoye stepped down after it came to light that the agency had falsified reports to the federal government for years, erroneously reporting that mandated inspections for lead paint had been done at NYCHA housing when they hadn’t. De Blasio, who defended Alatoye right up until she left, went on the defensive Monday when asked about why the city didn’t follow up with inspections at homes where children were reported to have lead poisoning. “Again the highest most stringent level is five micrograms, it’s actually a very low level of exposure, but what the federal government said is when you see that level, act quickly to try and make sure nothing worse happens,” he said. The CDC says that no level of lead in a child’s blood is safe, and that even low levels can affect IQ and the ability to pay attention. “And effects of lead exposure cannot be corrected,” the CDC website adds. 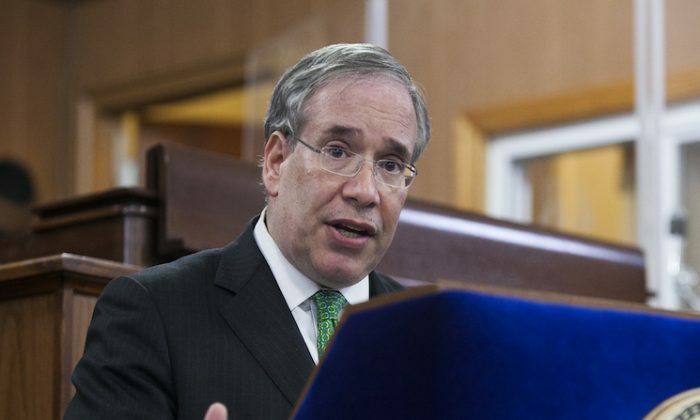 Stringer called for a complete overhaul of the NYCHA after the news broke in June that the city had entered into a settlement that required it to put $2.2 billion into a fund for toward substantive changes at NYCHA housing. The money was to be overseen by a federally-appointed monitor. When asked why it took the city’s Department of Investigation (DOI) to report the number of children testing positive for elevated lead levels in public housing, de Blasio said that the numbers had always been available, but that they were mixed with those of children in private housing.